The Melrose Apartments have beautiful, one-bedroom units for rent in the Nashville area. We are a luxury living, community style apartment complex in the vibrant neighborhood of Melrose. Our A6 unit has 620 square feet of living space along with a generous pet policy that allows you and up to 2 pets to live comfortably. Our location near Vanderbilt University makes us a great option for staff, faculty and students alike. At the Melrose, we provide luxury living at an affordable price. 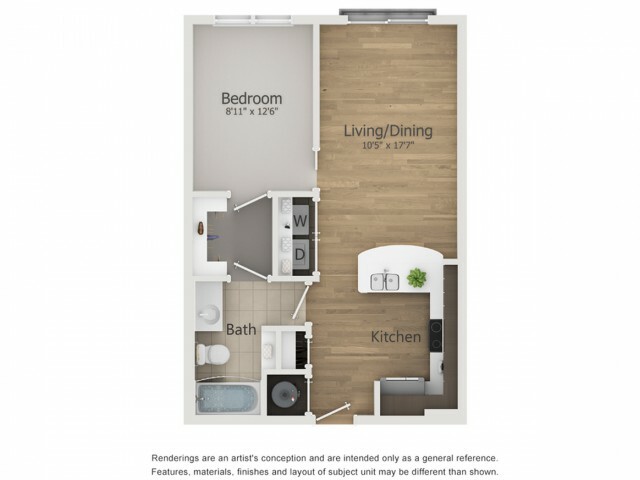 Our one-bedroom units are fully equipped with a gourmet kitchen, granite counter tops, a center island and solid wood cabinetry. Each bathroom is graced with a garden tub, ample storage as well as washer and dryer hookups. We provide energy efficient, upgraded lighting and a stainless-steel appliance package in every unit making us a green apartment complex. Luxury living is easy and convenient at The Melrose Apartments. We are proud of our community and invite you to become part of it. We really do have something for everyone. For those who lead an active life we have a 24-hour fitness center, City Fit classes 3 times a week and bike racks. For our residents who enjoy entertaining, we have a live music performance space, clubhouse with demonstration kitchen and outdoor grilling area. There is also a resort style pool with a sundeck to relax on, and well-lit courtyards. Our residents don’t have to venture far for a night out with several dining establishments on-site, like The Sutler Moon, Sinema and Fenwick’s 300. The Melrose neighborhood is populated with both fine and casual dining as well as great shopping. We provide our residents with a coffee and tea bar and a 24-hour business center for those late nights. There is no need to go far to find something to do, day or night. For a perfect urban oasis in the bustling city of Nashville, TN, consider moving to the Melrose Apartments. Give us a call today at (615) 696-7448 to schedule a walk through.